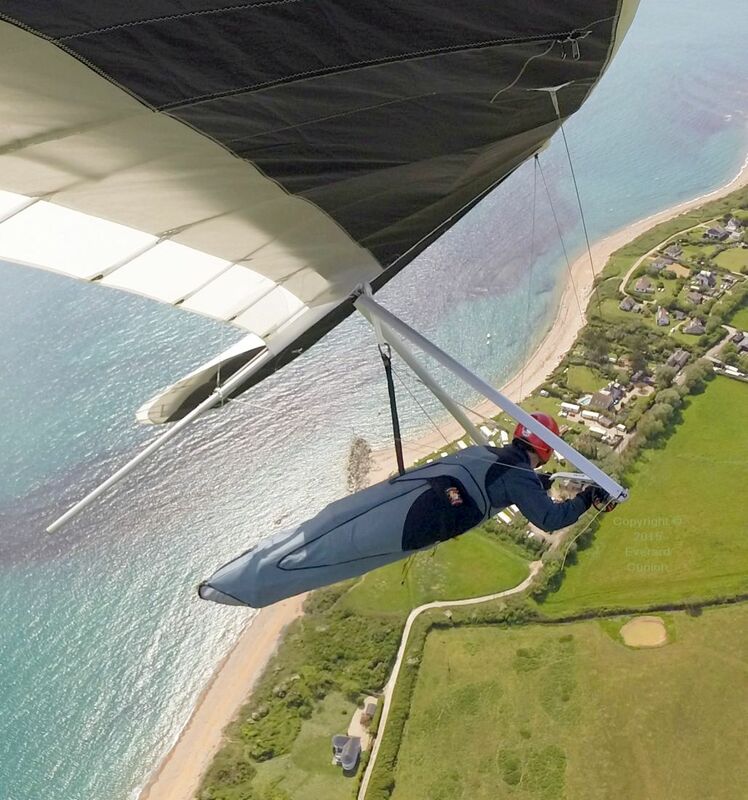 This page continues from Hang gliding 2015 part 1. A handful of paragliders soared the main cliff on a moderately windy day at Ringstead and, at one point, they climbed towards a cloud street developing over Portland, directly up-wind. As I climbed up under them from behind, I imagined the possibility of colliding with one. (Hang gliders fly faster than paragliders and the upwards view from a hang glider is limited.) In addition, I find flying over water somewhat spooky, so I sped off in a different direction and missed out on some potential height gain. The photo at left is above the western end of the bottom landing field. 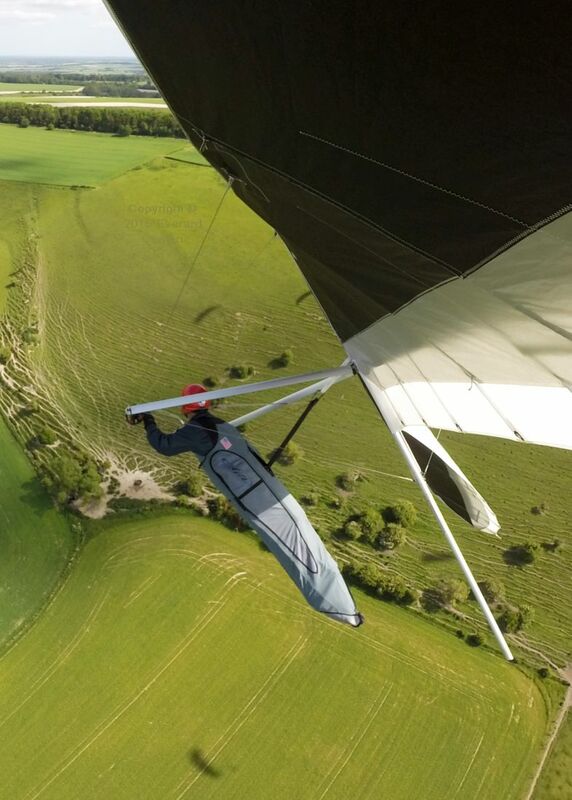 See the Report by A Webb in Eye in the Sky – May 2015 for some photos taken from one of those paragliders. 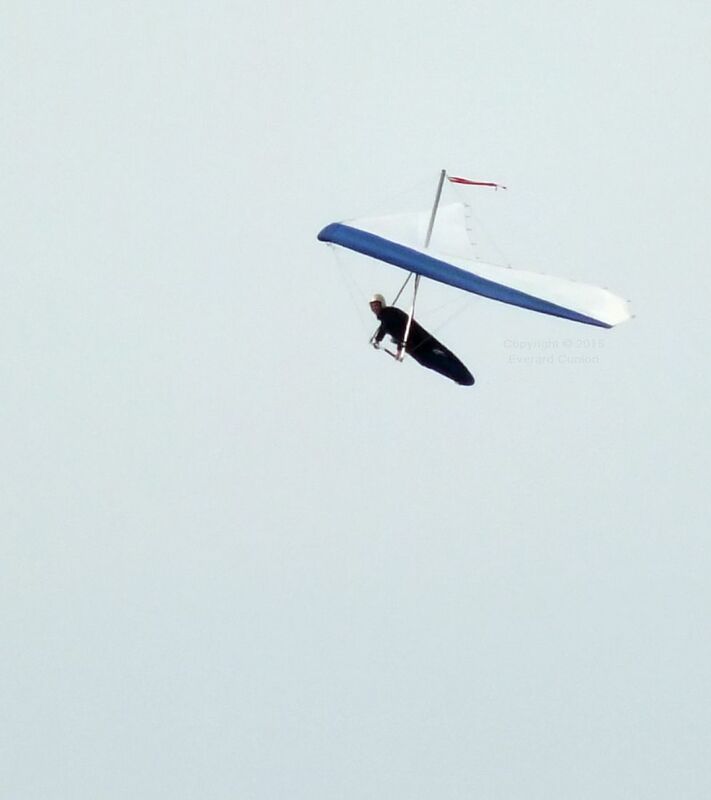 The Pacific Windcraft Vision Mark IV was a ubiquitous intermediate hang glider during the late 1980s and 1990s. 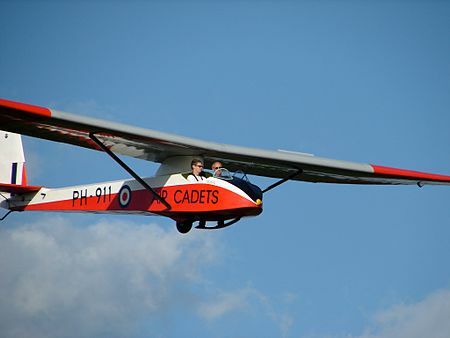 The photo at right is of a UK licence-built example, the Airwave Calypso, on base leg of its landing approach to the top field at Ringstead. 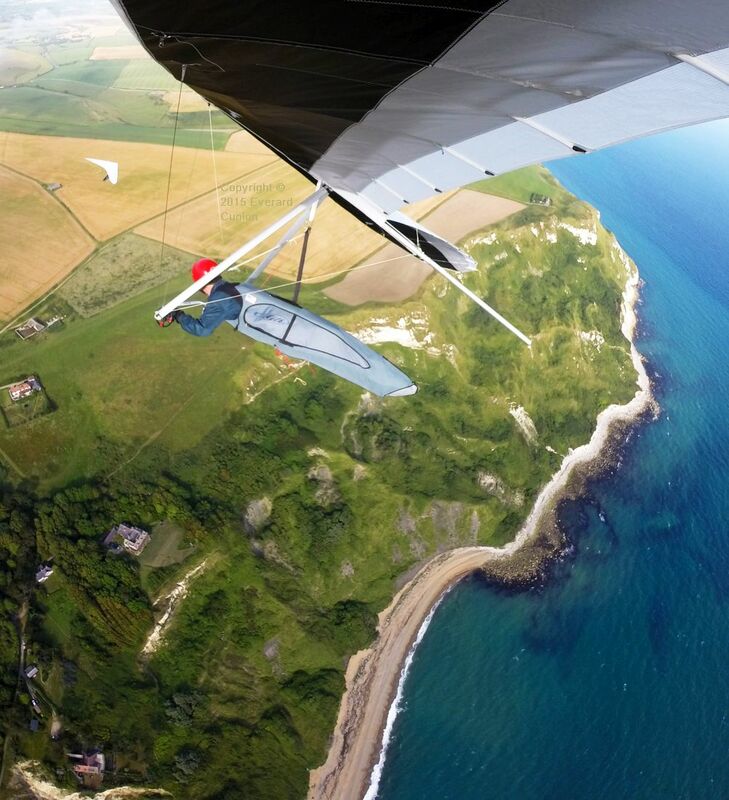 I put my de-rigged wing back on top of the car and, while I watched the Mark 4 soaring the cliff, a spectator introduced himself as an ex sailplane (gliding) instructor and ex RAF multi-engine pilot. He expressed an interest in the differences between paragliders, which had done so well earlier, and hang gliders. I described the fear I experienced during my nine years flying paragliders: When more than about 300 feet up, I felt as though I could fall out of the seated harness. I then mentioned my unease when flying over water and I was astonished when he replied that he felt the same way, even with four engines! 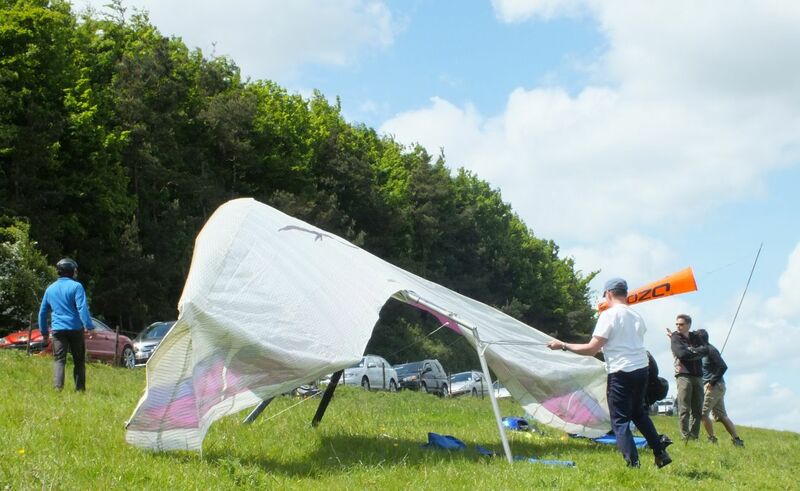 Rob D, who flies a high performance navy helicopter during the week, was de-rigging in the bottom field when I arrived at Monk’s down in early June 2015 to find light and variable thermic conditions, much as a couple of weekends before. 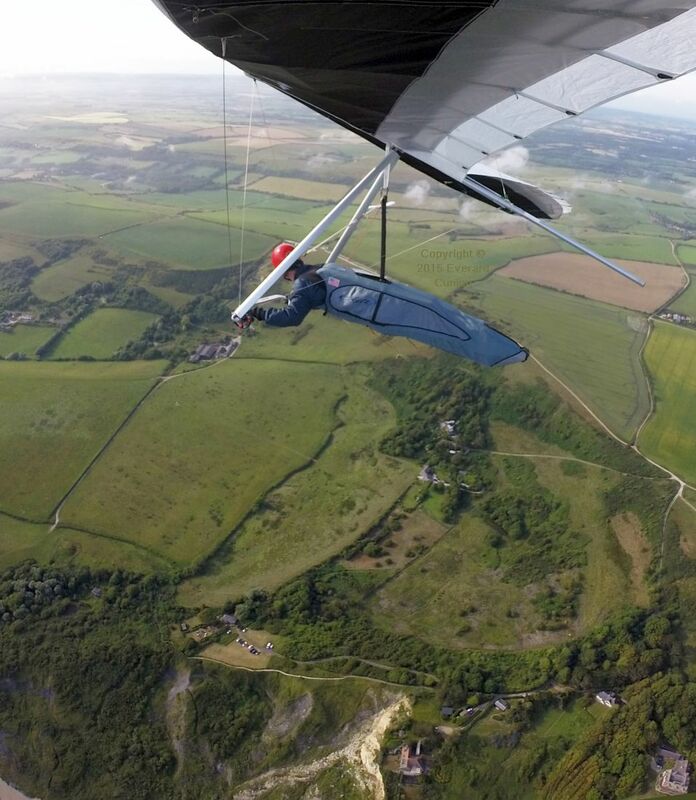 The club’s chief coach had already flown to the coast on his first flight in a new paraglider, arriving at Lulworth Cove, discovering a soarable sea breeze, setting off along the cliffs, and eventually landing at Ringstead. To read more about that remarkable flight along with several other paraglider cross-country flights that day, see Eye in the Sky (Sun 07 Jun 2015). Meanwhile, Rob retrieved his wing and set about rigging again. He flies a Moyes Lightspeed, an icon of flexwing performance made in Australia. Notice the absence of a king post and top rigging. 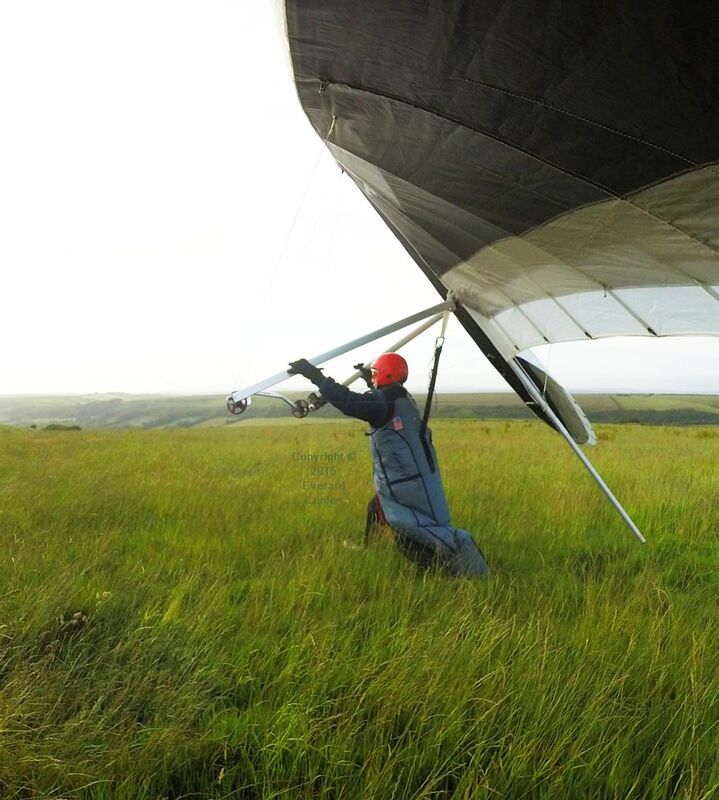 Negative loads (including the glider’s own weight when sitting on the hill) are borne by a beefy crosstube, in this case made of carbon fibre. Less drag, but more weight (and cost). However, it was not Rob’s day. He tried again and quickly sank to the bottom field again. After an hour or so of ‘hang waiting’, I launched when the airborne paragliders in the vicinity of the hill were going up, there was an increase in the breeze directly up the hill, and there was a big enough clear space in front of the hill for me to get safely away from the ground. Thermaling in proximity to others can be dangerous, so I moved out away from the hill, up wind. Fortunately, I encountered thermal lift and I tried to make the most of it to get up and away from the paragliders, but I just did not get very high. So, after about ten minutes of struggle, down I went. 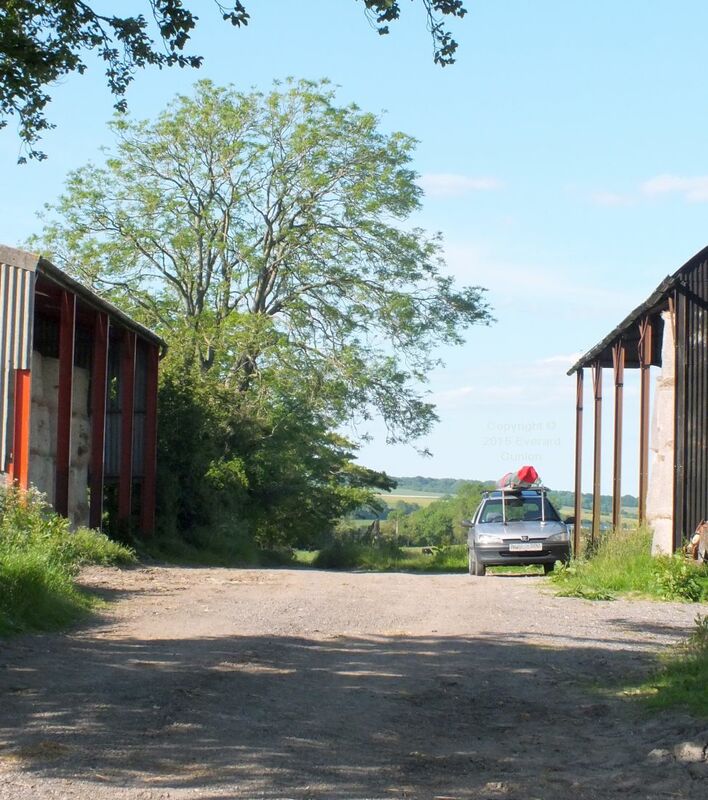 The barns where we park for retrieval are out of view behind the cow shed in the middle distance. Big landing fields, but a way to carry your gear. Then you have to walk up the hill to get your car. Fortunately, Monk’s Down is only about 300 or so feet high. This photo is five seconds before the next. 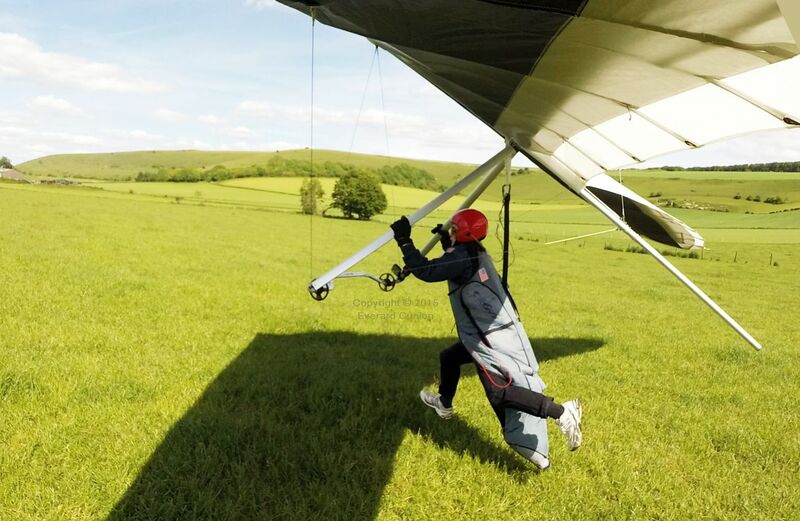 My harness blocks the take-off ridge and my main riser bisects the top landing field. (It also bisects Adam’s U-2!) The mound that contains the radar room at the south end of the emergency bottom landing field (RAF Ringstead) is visible at lower left (just above the trees/bushes). The west facing ‘step’ cliff (with house) is at bottom center. A tiny amount of the beach is at bottom left. Holworth House is at bottom right. 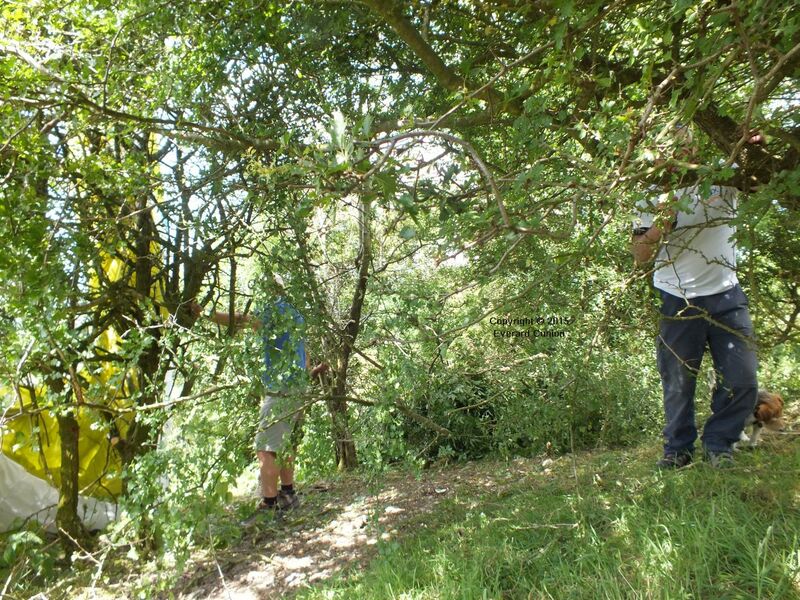 I launched at 18:00, after the wind had calmed on a windy day in early July. 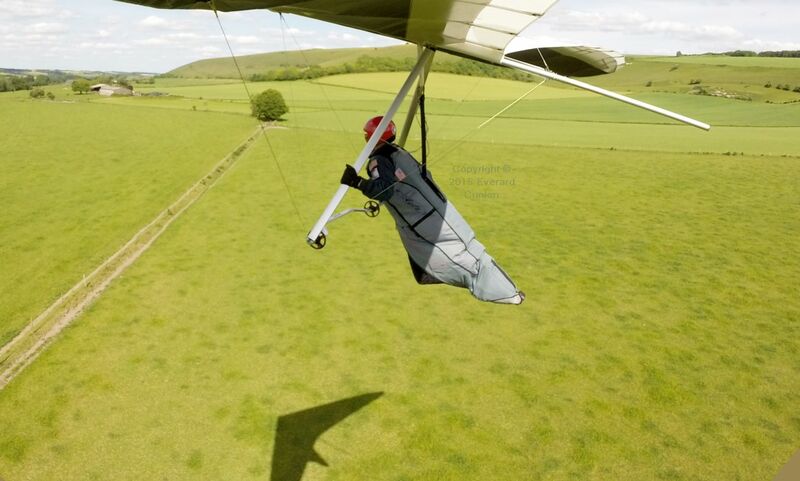 Although the wind was barely enough to lift the glider’s weight before I started my launch run (normally a bad sign) two other hang gliders were easily soaring the cliff. When I launched, I immediately encountered strong and random turbulence, so I headed straight out to the first ‘step’ cliff, keeping the emergency bottom landing field within easy reach should I encounter sink. Luckily, I encountered patches of lift and the turbulence lessened. I arrived at the cliff fairly low, but smooth lift soon elevated me to more than 1,100 ft above launch height. As is usually the case when the wind is westerly here, I encountered turbulence over the top landing field with a strong wind gradient and dead air on the ground. A strong flare was called for, which brought me to a dead stop.